A hearing test is a painless, non-invasive test that measures a person’s ability to hear different sounds, pitches, or frequencies. Diagnosis, treatment and management of hearing loss, balance disorders and other associated conditions. 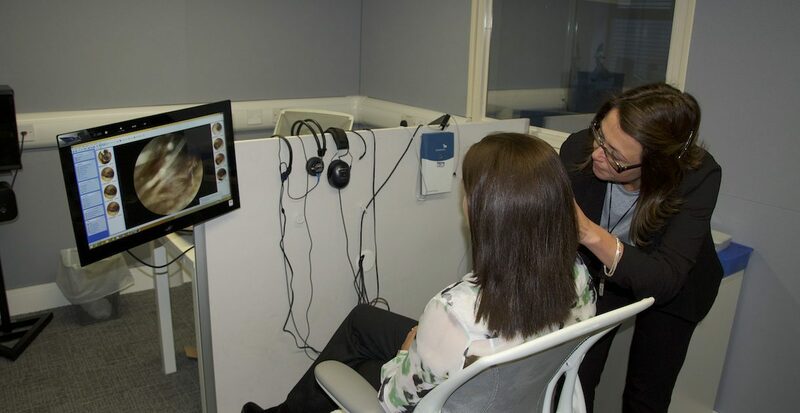 An audiologist is trained to carry out assessments on hearing by performing a number of specialised auditory tests and vestibular (balance) tests, as well as asking you some questions related to your medical history and hearing problems. The audiologist will decide if it is necessary for you to see an ear nose and throat doctor (ENT) based on your responses and the nature and type of your hearing loss. An audiologist is also trained to fit hearing aids and help you adjust to them. They also help design and implement personal and industrial hearing safety programs, newborn hearing screening programs, school hearing screening programs, and provide special fitting ear plugs and other hearing protection devices to help prevent hearing loss. The audiologist will look inside your ear with an otoscope, which is a small cone shaped scope with a light on the end. This helps see inside the ear and check whether there is anything visibly damaged. You are then required to sit in a soundproof booth wearing earphones which are connected to an audiometer. The audiometer produces sounds and tones of different levels and frequencies, which are transmitted to each individual ear. The audiologist charts the loudness on the audiogram which is a graphical representation of how well your ear responds to different levels of frequencies. You will be asked to raise your hand or press a button whenever you hear sound being sent to your ears. The audiologist records all the information received and analyses it. The extent of your hearing loss is based on the frequencies you could or couldn’t hear. The audiometry test measures the softest, or least audible, sound that a person can hear. The loudness of sound is measured in decibels (dB). A whisper is about 20 dB, loud music ranges 80-120 dB, and a jet engine is about 180 dB. 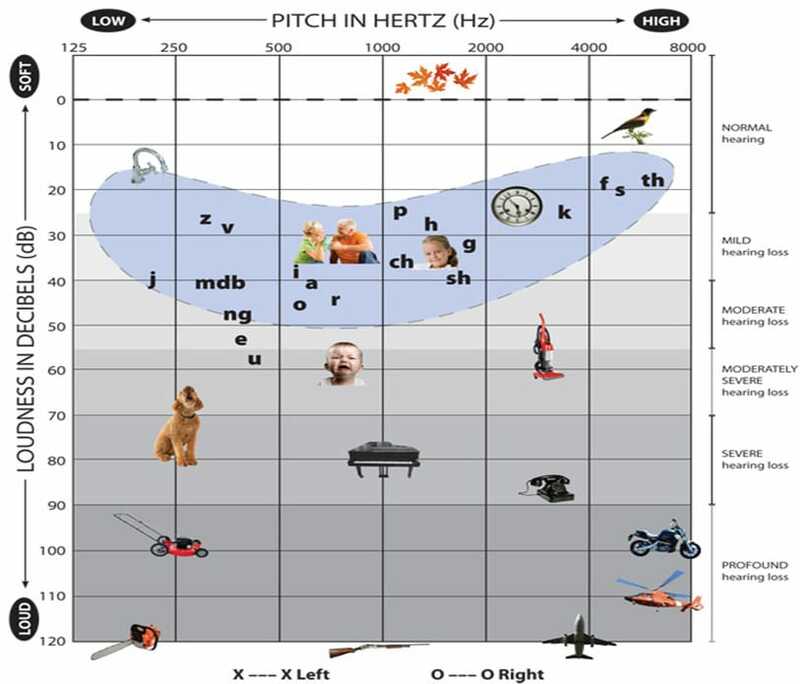 The tone of sound is measured in frequencies (Hz). Low bass tones range 50-60 Hz, high-pitched tones range 10,000 Hz or higher. Normal hearing range is 250-8,000 Hz at 25 dB or lower. The test is recorded on a chart called the audiogram. On an audiogram chart, red O’s indicate results for the right ear and the blue X’s indicate results for the left ear. 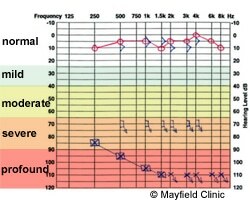 Audiogram of a patient with an acoustic neuroma shows hearing loss in the left ear. The red line is the right ear. The blue line is the left ear. A word recognition test (also called speech discrimination test) assesses a person’s ability to understand speech from background noise. If your speech discrimination is poor, speech may sound garbled. Word recognition scores can be helpful in predicting the usefulness of a hearing aid. A tympanometry test detects problems such as fluid/wax build up, perforated eardrum, ossicle bone damage, or tumors in the middle ear. Acoustic reflex testing evaluates the cranial nerves and brainstem. For this test a device is placed into your ear. This device changes the air pressure in your ear and makes the eardrum move back and forth. A machine records the results on a graph called a tympanogram. The results of a hearing test are not typically given in percentage but instead in a degree. The degree of hearing loss a person has can be characterized by how loud a sound has to be in order for the person to be able to hear it. The higher a person’s hearing threshold, the worse the degree of hearing loss the person has. 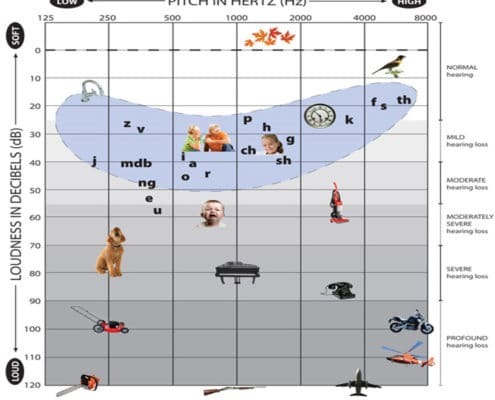 Mild hearing loss: Thresholds for various pitches are between 25-40 dB HL. With a mild hearing loss difficulty will occur for soft speech and listening in background noise; however in quiet, a mild hearing loss is manageable. A hearing aid in this case may be helpful. Moderate hearing loss: Thresholds are between 41-55 dB HL. With a moderate hearing loss you will experience difficulty hearing conversations, especially while in background noise. The TV or radio may also be turned to higher levels in order to be heard clearly. A hearing aid in this case will be most beneficial and is strongly recommended. Moderately-severe hearing loss: Thresholds are between 56-70 dB HL. For a person with a moderately-severe hearing loss clarity of speech is significantly reduced and the most difficulty will occur in groups. A hearing aid in this care is essential. Severe hearing loss: Thresholds are between 71-90 dB. At this degree of hearing loss, normal conversation will not be audible. Loud speech is also difficult to hear or understand. At this point people with severe hearing loss will only hear if speech is shouted or amplified for them. A hearing aid is less beneficial. Profound Hearing loss: Thresholds are 91 dB and higher. At this level, people with profound hearing loss may have difficulty understanding even amplified speech. A cochlear implant may be considered as hearing aids are of little benefit. Excessive noise exposure is one of the most prevalent causes of hearing loss but is also completely preventable. In the day and age we live in hearing aids can do wonders for a hearing impaired person, but it will never restore normal hearing. Annual hearing evaluations is a good start to protecting your hearing. This will ensure that the right procedure can be set in place as soon as a problem is detected. There are many different kinds of hearing protection available on the market. It differs from universal hearing protection plugs to custom made plugs and for those who need it electronic protection plugs can be found.